2/2/13 - The Losi Combat 2P SE (Shield Edition) Tent from Nemo Equipment - Shield is a military shelter that provides increased space, dual access and ease of set up while weighing less than issue combat tents. The Losi is but one in a full lineup of shelters that Nemo offers. NEMO Equipment - NEMO Equipment was started in 2002 by founder Cam Brensinger. Based in Dover, New Hampshire, the name 'NEMO Equipment' originated from New England MOuntain Equipment. An industry leader in the civilian outdoor market, NEMO has introduced innovations such as their AirSupported Technology (AST), and offers shelters ranging from the single person to groups of half a dozen campers. Besides tents and shelters, NEMO also manufactures a variety of backcountry products including sleeping bags, pads and pillows. In 2006, NEMO began adapting its shelter technology for U.S. Special Operations Forces and launched its Shield product line. NEMO Shield Edition products combine the latest in mountaineering equipment technology with materials suited to the warfighter. The Shield product line includes designs from their civilian product line that have been adapted to military use (tactical colours and modified features), as well as other products not available on the civilian side like watertight, shoot-through weapon bags. Shield Edition products are available in both overseas-manufactured and Berry compliant versions. Minimum order quantities may apply for certain products and colours. The NEMO products featured in this writeup are the Fillo SE backpacking pillow, Cosmo Air & Pillowtop combo (commercial version) and the Losi Combat 2P SE tent. I'll start with the smallest item and work my way up. Nemo has a youtube video channel with useful videos on their products. I'll be linking to some of the videos in this writeup. The Fillo SE (commercial Fillo shown here) is an inflatable backpacking pillow that offers inflatable cell baffle technology combined with one-inch thick memory foam to provide cushioning, adjustable height and comfort in the field. Dimensions - 17" x 10.5" x 1" (uninflated). Maximum inflated thickness: 4"
Description - There are actually three main components that make up the Fillo. The first is the pillowtop cover made of washable polyester microsuede (shown here in Moss green - the 2013 model will be Coyote). The cover is a 17" x 10.5" rectangle with a hang loop on one end, and an opening for the inflation valve at one corner. The Moss green microsuede material is very soft and makes up the top of the cover, providing some traction unlike most smooth nylon fabrics. The microsuede wraps around the bottom where there is a panel of black nylon fabric. Small loops are sewn at intervals through which elastic shock cord is laced, providing a grid to hold extra clothing in place for additional sleep height and head support. The cover has an opening at one end with a flap, which is secured with low profile velcro. Inside the removable cover are the other two components. One is a rectangle of 1" thick memory foam, and the other is an inflatable baffled air cell. The memory foam is enclosed in mesh - it's sewn inside and the mesh covering is not removable. The mesh cover has a sleeve/pocket in which the air cell is inserted. The air cell has tiedowns sewn at each corner which allow it to be tied inside corresponding ties inside the mesh sleeve, so that the corners are always secured and it doesn't shift inside. When inside the cover and in use, the foam is on top and the air cell is on the bottom. The air cell has a three-stage pull-open/push-close valve at one corner (twist to lock), which protrudes through an opening in the microsuede cover. It only takes me 2-1/2 full breaths to inflate the cell completely (about 5 seconds). Check out NEMO's video with tips on how to use the valve. The user can adjust the desired thickness of the Fillo by varying how much the cell is inflated. The cover has an integrated stuff sack that stows inside the opening so it doesn't get lost. It has a drawcord closure. The pillow can be folded up, rolled up, scrunched up and stuffed into the sack, and NEMO has a video that illustrates how to pack the Fillo. When packed, the Fillo forms a cylinder about 6" tall and 4" in diameter. If weight and bulk are an issue (but you still would like a pillow), the air cell can be untied from the mesh sleeve and used with the cover without the foam. I recommend using the cover as it's just more comfortable against the skin. The cover and deflated air cell are essentially flat, and can be rolled up into a 4" tall x 2.5" diameter package. In a pinch, you can also use the air cell by itself, like other inflatable pillows, but the cover and foam definitely add a level of comfort above it. When fully inflated, the Fillo has a maximum thickness of about 4" to 5". The baffles keep it flat, instead of rounding out too much in the middle. If you want more support, you can add thickness to the Fillo by folding/rolling up a garment and securing it under the Fillo with the elastic shock cord. NEMO offers a full lineup of inflatable sleeping pads, ranging from short 2/3-length versions 1.5" thick to full length insulated versions 3" thick. The Cosmo Air SE & Pillowtop SE Combo is similar in configuration to the Fillo pillow - it's a modular system consisting of a slipcover and foam pad (the Pillowtop), and the inflatable pad/mattress (Cosmo Air). The Cosmo series is similar to the Astro series, with the addition of an integrated foot pump for easy inflation, and about a half inch more thickness. The Cosmo Air pad can be used by itself without the Pillowtop, like any other inflatable air pad. The Cosmo Air also comes in an insulated version with Primaloft insulation (not pictured here). Dimensions - 76" length" x 25" width" x 4" total thickness (with Pillowtop). Without the Pillowtop, the Cosmo Air pad itself is 3" thick (inflated). Weight - 3 lb 15 oz (combo). The Cosmo Air by itself is 1 lb 13 oz. Packed size - 13" x 8" diameter (Cosmo and Pillowtop combo); 9" x 4.5" diameter (Cosmo Air pad only). Cosmo Air Description - The Cosmo Air is a light weight inflatable sleeping pad with a built-in foot pump. The Cosmo Air itself has no addtitional insulation or internal foam padding; so it relies solely on air inflation. Instead of having longitudinal baffles, the Cosmo Air has horizontal I-beam baffles, which create a flatter sleeping pad surface and supports body contours better than longitudinal baffles. The horizontal baffles prevents to pad from folding around the body. At the head end is a larger 'pillow baffle' that serves as a small pillow. The Cosmo Air's built in foot pump adds convenience at the cost of some additional weight and bulk (not much at all though - about 9 oz over the Astro Air). The foot pump is located at the foot (haha) of the Cosmo, opposite the head end, and has two large one-way inflation valves. To inflate the Cosmo, both valves are opened, and secured in the open position with the little tabs on the caps. Foam inside the foot pump gives it its shape and is what makes the pump chamber expand. Without the foam to expand it, it wouldn't draw any air in through the valves. So, you open the valves and allow the foam to expand, if you've just unpacked it from the included stuff sack. Once the pump is expanded, you just start pumping it with your foot by stepping onto the designated spot (indicated by an arrow), which pumps air into the main chamber of the Cosmo. When the pump is flattened, you let up with the foot, and allow the foam chamber to expand again. As it expands, it draws air through the two larger one-way inflation valves. The valves have little flaps that seal the opening when the pump is stepped on, pushing air into the Cosmo. Note that a little air does escape from the one-way valves as you pump - this is normal. You repeat the process and once the Cosmo has been inflated to your liking, the valve caps are closed. There are two deflation valves, located at the head end of the Cosmo. One is a larger opening located on the bottom corver of the Cosmo; the same size as the inflation valves - a 'dump valve'. Opening this lets the air out very quickly. The other is at the opposite corner; and is the same micro-adjust three-stage pull-open/push-close valve (twist to lock) as the Fillo has. This can be used to make minor adjustments to the amount of firmness. You can actually blow through the intake valves, but the smaller micro-adjust one is easier to use for minor adjustments. Obviously, you have to make sure that the dump valve and micro adjust valve are both closed before inflating the Cosmo with the foot pump. Pillowtop Description - The Pillowtop for the Cosmo Air has the same polyester microsuede fabric on top as the Fillo (the 2012 SE model was moss green, shown here. The 2013 model is Coyote). The bottom of the cover is made from lightweight black fabric. It's removable and washable. It has a grey reinforced area around the foot pump area and features easy access to the inflation and deflation valves. There's a large opening at the foot where the foam pad and Cosmo Air are inserted, with the foam pad on top. The foot pad protrudes out of this opening, and there are cutouts at the head end for the deflation valves. Inside the cover, are six tiedown cords, to which the 1" memory foam pad is tied into. The memory foam pad measures 76" x 25" x 1" and is perforated to facilitate packability. A lightweight non-removable mesh cover is sewn over it, with the tie cords sewn in that correspond with those inside the microsuede cover. This keeps the foam pad properly aligned inside the cover. The mesh covering is not sewn to the foam pad; I wouldn't mind seeing it attached somehow at the corners. Putting it all together - As illustrated below, the Cosmo Air can be used by itself as an inflatable pad, if you don't want the added bulk of the Pillowtop. The Pillowtop definitely adds a measure of luxury with the memory foam. The foam fills in the space between the baffles and makes the assembly feel completely flat. It's as close to sleeping on an actual matteress as I've felt on a camping pad (I also have Therm-a-rest and Big Agnes pads). The commercial Combo is illustrated here, and comes with two compression straps and a stuff sack. The rolled up size is about 13" x 8" diameter. Okay, now we've come to the tent. NEMO Shield Edition offers a full lineup of shelters for the warfighter; some based on their commercial models, some unique to the Shield product line. Users can choose from conventially pole-supported shelters or NEMO's AST (Air Supported Technology) shelters, which uses inflatable airbeams to provide the shelter's structure. NEMO's Shield Edition product line includes small, individual-person shelters; 1 person combat tents that link together, 2 and 3-person shelters/tents, tarp shelters, and large shelters that fit 6-10 people. The range of shelters covers every condition from dry/wet, hot climates to windy, artic conditions. The Losi Combat 2P SE Tent is based on the commercial model - the Losi 2P two-person backpacking double-wall tent, with changes to adapt it to military needs (besides the colour). The Losi Combat also comes in a 3-person model; the 3P. The Losi is a three season shelter that offers increased space, dual access and ease of set up over the issue combat tent. The Losi has a full mesh canopy for ventilation and a separate rain fly for wet weather. Note that the the model shown here is in military green; the 2013 model is available in coyote as well. I've uploaded the 2013 product sheet to my site for the Losi Combat SE Series, so download it here. Dimensions - 86" length" x 54" width" x 46" max interior height. Max width with vestibule is 106". Capacity - 2 (sleeping only). A very roomy 1-person tent. Included accessories - Roll-up style stuff sack, gear caddy, stakes (8), guy-out cord (4), repair kit, pole repair sleeve. Stuff sack/Tent Packed - The Losi comes with a roll-up style, green and black nylon/mesh stuff sack for convenient organization and transport of the tent and its components. The package includes the tent and fly, a gear caddy, eight aluminum stakes, four guy cords, long and ridge poles, and a repair kit (tear-aid patches and an aluminum sleeve). The sack measures 43" long x 23" wide, and has a large main compartment for the tent and fly (and footprint - not included), a pole compartment, and another one for the rest. When empty, the sack makes nice ground mat for cleaning a rifle, and keeping parts out of the dirt. The sack is rolled up and secured with velcro, and two side-release buckles and compression straps. Set up instructions are printed onto a sheet that is sewn inside the mesh tent compartment. I'd also recommend having a bit of tape in the kit to secure the aluminum pole repair sleeve should a tent pole break. Poles and stakes - The Losi comes with aluminum poles - two long poles and two shorter ridge poles. The poles are top-of-the-line DAC Featherlite NSL green poles. The DAC Featherlite NSL are widely used by the top-brand backpacking tents and are chosen for their high strength to weight ratio. The 'NSL' stands for 'New Sleeve', and uses aluminum inserts to connect pole sections. The inserts are mechanically expanded into the pole ends, rather than glued or crimped. This design makes the pole junctions 20% stronger than the main pole tubes, permitting the use of thin tube walls. The 'green' label comes from DAC's 'green anodizing' process, which eliminates the use of phosphoric acid and nitric acid during the anodizing process. The Nemo aluminum J-stakes are 7" long, with a three-sided design, a notch at the top for securing guylines, and an attached nylon pull for removal. They're pretty much identical in appearance and function to the popular MSR Ground Hog stakes. It's been a while since I've been camping, partly due to lack of time and opportunity. Most of the places I go require an AWD or a vehicle with decent ground clearance - neither of which I had until last year, so I was dependent on friends with SUVs. So, right after New Year 2013, I got together with a few good friends for an overnight shoot/camp in the desert, which was a good opprotunity to try out the Losi Combat 2P. The weather was clear, with a high of 51°F during the day and dropping to 19°F at night. I'd like to be clear that this was car camping, not a backpacking trip, as there's no way I'd be able to hike with even a fraction of what I brought with me - 4 rifles, 2 handguns, .223 and .308 ammo, food, water, sleeping bags, different clothing, gear, targets etc. It's a wonder I fit everything in my car, actually. As for backpacking, with a weight of less than 6 lbs, the Losi Combat 2P meets the general guideline of less than 3 lbs per person for a 2-person backpacking tent. 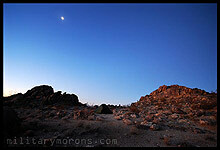 The spot - The place I shoot/camp has no formal campground; it's just a spot in the middle of nowhere in the desert. It's blazing hot in the summer and cold in the winter, sometimes getting snow because of the elevation (about 2800 ft above sea level). The area is a sort of plateau with low hills (providing good backstops for shooting) and a couple of hundred feet above the rest of the desert floor. In the photo on the far left below, that's the view overlooking the desert floor towards some other mountains in the distance. The ground is generally rocky and sandy, scattered with small shrubs and bushes. I usually pitch tent in a different, more sheltered spot lower down, but wanted to set up the Losi in a more exposed area, as I anticipated strong winds when the sun went down. I scouted the area, looking for an area that was large enough, more sandy than rocky, and was relatively flat and level. I found a spot that seemed level enough such that I wouldn't slide off my sleeping pad at night. It was also in between two small rock hills that acted as a natural funnel for wind to blow through, which I wanted to test the Losi in. I set about clearing it of any large stones or rocks. When I was satisfied, I broke out the Losi. Fly shelter - The Losi Combat 2P fly can actually be set up by itself, without the tent, as a lightweight shelter from the sun, rain etc. There are velcro tabs/loops on the inside of the fly that the tent poles are routed through, and the fly forms a floorless shelter that can be set up very quickly if a tent isn't needed. I asked Nemo for a footprint for the Losi, but they shipped the one with the wrong corner attachments (Jake's Feet connections instead of grommets). It still worked just fine as the pole ends went through loops on the corners. I consider a footprint an absolute necessity to prolong the life of a tent floor, especially if the ground is hard and abrasive like in the high desert. Nemo offers footprints to match each of their tents; I don't recommend a generic tarp. The Losi 2P footprint is 70D abrasion-resistant nylon fabric and reduces wear and tear on the tent floor from contact with the ground. Here, I used it with the fly. The footprint has two sides - a matte side and a shiny side. The matte (uncoated) side faces the ground. Setting up the fly shelter was as simple as assembling the main poles, routing them through the velcro loops, and securing the grommets on the corner straps over the ferrules of the poles. Note that only the main poles are used in the set up of the fly shelter; the ridge poles are not used. I actually found it easier to assemble the shelter upside down when securing the ends on the poles, then flip the whole thing over when I was done. The corners can be staked and the vestibule doors guyed out, but I didn't do it in this instance as I was going to move on to the complete tent assembly, and just wanted to illustrate the fly setup for the write up. You can see that there's quite a lot of room in the fly shelter, and a lot of head room. Tent without the fly - To better illustrate the Losi's internal and external features, I first set it up without the fly. The Losi Combat 2P differs from its civilian counterpart in two major ways: the Combat 2P uses less mesh in its overall construction and uses pole sleeves instead of pole clips, to connect the canopy to the poles. The sleeves are continuous for ease of pitching in the dark - just get one end of the pole started and push it all the way through to the other side. Clips are generally lighter, but sleeves distribute the fabric tension along the length of the sleeve rather than at individual clip points. Pitching the Losi is pretty much bonehead simple. 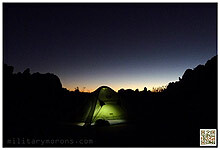 Before I went out camping, I had set it up at home to familiarize myself with all the features of the tent. It couldn't have taken more than a couple of minutes to pitch the Losi. The main poles are inserted into the sleeves - they cross at the peak of the tent. At each corner of the tent is a strap with three metal grommets and a cord loop on the end. The ends of the tent poles are inserted and secured any one of the three grommets. You adjust the tension/tightness of the strap (and poles) by using different holes. A pole replair sleeve comes with the Losi, in case a pole breaks; you just need to have some tape with you to secure it after slipping it over the break. Once the main poles ends are in their respective corners, the tent is free-standing, just like the Fly Shelter was. You can move it if you need to, just by carrying it around. The ridge poles are then inserted through the ridge pole sleeves above each door, and the ends secured by the grommeted straps protruding from the side walls of the tent. The ridge poles running along the length of the tent terminate about halfway up the side of the canopy, and provide nearly vertical walls on all sides for maximum interior space. The footprint had loops in each corner so I slipped them over the tent poles at each corner. At this time, the corners can be staked, but since I was going to attach the fly next, I held off. Nemo has a video on how to set up Losi series tents here. Note that this features the civilian Losi with pole clips instead of the pole sleeves. Tent construction - The Losi Combat 2P is made up of a few different kinds of fabric. On this particular model, the floor is waterproof 30D PU nylon. The floor is of the perimeter-cut type, with the floor sewn to the side walls made of the same fabirc as the fly; 30D PU ripstop waterproof nylon. The seam between the floor and the sidewalls are seam taped so that the inside is protected from wet ground and grass. The rest of the canopy is a combination of No-See-Um mesh and 30D ripstop nylon (uncoated). The mesh panels on the ends and sides (about half the door) provide ventilation while keeping out the bugs. The only drawback to mesh in the desert is that it can allow fine dust and sand through if carried by the wind in the air. I inspected all stitching and seams tape seals, and construction/workmanship is what you'd expect to see from a top tier tent manufacturer. The symmetrical design of the Losi Combat 2P and dual C-shaped doors with two way zippers ensure that each person has an entry/exit, and doesn't have to climb over the other one to get to their side of the tent. The doors zip open fully and can be rolled up and secured with a strap and cord lock to tie-back loops on the outside of the canopy. Inside the tent - The Losi 2P Gear Caddy is supplied with the tent. It comes pre-installed inside it. It has a trapezoidal shape, made of mesh and connects with glove hooks to loops located inside the tent. The tent has loops on both ends so that the Gear Caddy can be installed at either, or two Gear Caddies can be used. The Gear Caddy has four smaller slot pockets at the top, and four large pockets at the bottom. In the middle at the top are two smaller 'Light Pockets'. The Light Pockets are made of light-diffusing fabric and provide a nice diffused light when your headlamp is placed inside one of them. The Gear Caddy is really useful for keeping light weight items inside the tent organized and out of the way. I put my glasses in one of the pockets when I went to sleep without worrying about crushing them, finding them or having to use a glasses case. There's a hanging 'envelope pocket' on each side of the tent near the door. I found it great for storing my water bottle there for convenient access at night when I got thirsty. Inside the roof of the tent are little webbing loops sewn in various locations (I counted 13). There's one in the middle for hanging a light from, and the others can be used for hanging whatever small item you choose to. I wouldn't mind seeing the webbing loops changed to cord or 550 cord, as the webbing loops are sometimes flat/closed when new, so you have to wiggle them a bit to open them up to thread something through. Nemo also makes a Gear Loft that mounts inside the roof and adds additional overhead storage so floor space can be maximized. At each corner of the tent floor are snaps to which a 'Paw Print' can be attached. The Paw Print (not shown here) is a removable liner for the tent; protecting the tent floor and adding comfort. The floor of the tent is crinkly in the photos below because the corners were not staked yet. Living space - The Losi Combat 2P SE is a two-person tent. This can mean different things from various manufacturers. In general, a two-person tent should have the floor area to fit two full size sleeping pads like the Cosmo Air. Two people can sleep comfortably side-by-side inside the Losi and the near vertical walls allow you to sit straight up almost anywhere inside the Losi 2P. It doesn't have the cramped feeling that you get from tents with more steeply sloping walls. The photo of me sitting cross-legged inside the tent illustrates how much head room there is in there. When kneeling or stooping inside the tent, I don't feel as if my head is constantly bumping up against the canopy. With two people sleeping inside the tent, there's not much room left for gear (except at the feet, depending on how tall each person is), so having two gear caddies and maybe the Gear Loft might be a good idea. Other gear can be stored in the vestibule area if the rain fly is set up. For one person use, it's spacious with room inside the tent for a lot of gear. Set up without the fly, the Losi is bright, breezy and airy, making it perfect for spring through fall in warmer conditions. When the temperature falls or the weather turns nasty, you'd want to set it up with the fly. Installing the fly - The fly is made of 30D PU waterproof ripstop nylon with a DWR. All seams on the fly are seam taped. When first setting up the tent at home, I went through my usual 30 seconds of 'which way does the fly fit on this thing? ', but it's really quite obvious after the first time you figure it out. Vestibule zippers over the doors. That's it. The fly has velcro wraps at specific locations that wrap around the poles. I first threw the fly over the tent, rotating it so that it was oriented correctly. I then located the velcro wrap at the center/peak of the fly and secured it around the two main poles where they cross each other at the top of the canopy. There are four more velcro wraps that secure at each corner where the ridge poles cross the main poles. Lastly, a velcro tab above each vestibule zipper secures to velcro sewn to the ride pole sleeve just over the door. Approximately 2" of space is maintained between the tent canopy and the fly, all around. Once the fly was secured by its velcro loops to the tent, I then attached the grommeted straps at each corner of the fly to the main tent pole ends. So, each pole end went through both the tent and fly grommeted straps. I then staked each corner, starting out with one, then moving to the diagonal corner. I staked the other two corners, stretching the tent floor out so that the floor was somewhat flat and free of large wrinkles. The vestibules have their own adjustable anchors/guy lines attached, so I used the remaining four aluminum stakes to guy out the vestibules. I then tensioned the guy lines a bit, making sure that tension looked pretty equal all around. I then stood back and admired my hard five minutes' worth of work. I walked around, shaking the tent and it felt really taut, solid and sturdy. For ventilation, and to reduce condensation/internal moisture inside the tent, there are two overhead vents in the rain fly. The vents are sealed closed with velcro, and each has a little 'stick' that props them open. The end of the stick has a small velcro tab on the end and attaches to a patch inside the vent. The vestibules add outside storage space for equipment/gear and are pretty spacious. Each person has their own vestibule and entrance, minimizing tent access conflicts. If you look at the way I've guyed out the vestibules, I've done it in such a way to maximize the vestibule area and airflow through the tent (large gap between the fly and the ground). However, if less of a gap between the ground and bottom of the vestibule is desired, the vestibule can be staked such that the door touches the ground. This means that there'll be less vestibule area, but it'll also reduce the amount of wind-borne sand/dust blowing through the gap under very windy conditions. The vestibule door is closed with the full length zipper, or you can just velcro it closed in a pinch using the velcro that secures the rain flap over the zipper. The left side of the vestibule door rolls up and secures back in the same manner as the main tent door. There are additional guy line loops on the black reinforced guy points on the fly which allow extra guy lines to be attached for additional stability under windy conditions. I had already used up all eight of the supplied stakes, so if I wanted to take advantage of them, I'd need four more. Four extra guy lines come with the Losi, though. With the fly installed, it's still translucent and lets in a fair amount of light through during the day, giving the tent a pleasing diffused glow inside. As you can see in the photos below, the Losi Combat 2P is almost luxuriously spacious for one person + gear. I brought a lot of stuff into the tent with me - my web gear, guns, bags, etc, and had room for everything. While a 1-person shelter would obviously be lighter weight for backpacking, a 2-person tent is just so much more comfortable when car camping. Notes/Observations - Since I had set up the Losi Combat 2P a couple of times at home before going out to the desert, pitching the tent was a piece of cake. Having all those extra loops inside the canopy roof are some of the little details that I like about the Losi. It's evident to me that a lot of thought has gone into the design of the Losi; not only to design a shelter from the elements, but also to make it as convenient and user-friendly as well, with attention to detail. The way the Gear Caddy attaches and functions is just awesome. I didn't know I could get that excited about such a simple yet practical tent accessory. The numerous loops in the ceiling provide a lot of options for hanging a light; I hung my Sunwayman V10R pocket light via its pocket clip inside the tent. Windless night - As I mentioned above, I purposely picked a spot to set up the Losi to expose it to as much wind as possible when it kicked up. It never kicked up. Just about every time I've been out camping in the high desert, the wind starts blowing up in the evening, letting up only sometime in the early hours of the morning. This was the calmest I'd ever experienced, and my buddies also commented on that fact as well. It was great for shooting and doing everything else we were doing, but I didn't get to test the Losi out in strong wind, much to my disappointment. One of the things I wanted to see was whether the fine desert sand/dust would be kept out, as the fly does not come all the way to the ground on the ends. When I've camped out in the desert before, I've tried to ensure that the the tent fly is as close to the ground as possible so that when it starts getting windy, the wind goes over and around the tent rather than through it, reducing the amount of powder-like dust coating everything. Comparing the Losi Combat 2P to its civilian counterpart, you can see that the the Combat 2P has a lot more solid fabric than mesh. The solid fabric comes up to about halfway up the tent, and doors, with the mesh panels on the upper portion of the canopy only. Even though the fly doesn't come all the way to the ground on the ends, there's enough overlap between the fly and the solid fabric that it doesn't look like it will be as much of a concern as I initially though. As I pointed out earlier, the vestibule door can be also be staked so that it closes the gap with the ground, and the vents on top of the fly can be sealed shut. Camping out in the desert presents a unique set of conditions that you may not encounter elsewhere, and there isn't one tent that will cover all environments (much like clothing). When the desert winds blow, you just have to pick your priorities between ventilation and getting dusty - no matter what tent you have. The Losi is a three-season tent; three season tents are usually designed for spring, summer and fall conditions, with ample ventilation and air flow. Nemo offers both single wall and double wall tents in their lineup with different attributes that should cover just about any weather condition you may encounter. Sleeping - Knowing that the temperature could drop below freezing at night, I brought along my Kifaru Regulator sleeping bag system for the trip which was rated to provide comfort down to -5° (+20° MOB and 40° Base bag. 'Comfort' is a relative term of course, and everyone sleeps differently. I kept the fly vents open since there was no wind, so internal condensation wasn't a concern. The Cosmo Air and Pillowtop combo is amazingly bed-like. Even my wife commented on its comfort, when she tried it out at home. She doesn't like the Therm-a-rest or Big Agnes sleeping pads that I have, and was impressed with the Cosmo. The Pillowtop really takes the Cosmo a step further, because it not only provides a flat padded surface, it pretty much eliminates the crinkly noise you get when you move around on most sleeping pads. Same thing with the Fillo. The microsuede covering and foam pad make it one of the quietest inflatable pillows I've tried. I'm a light sleeper, so how much noise my camp pillow makes when I move around is a big consideration for me. I change position throughout the night and a creaky, crunchy-sounding sleeping pad and pillow can wake me up. The ground wasn't as perfectly level as I had originally thought, so there was a slight slope towards my feet and the microsuede surface of the Pillowtop also helped me stay planted on the pad. I don't seem to generate much body heat when I'm sleeping, but I was quite comfortable in my Kifaru Regulator. I even had to keep the side unzipped part of the time. Waking up in the middle of the night to go pee was unpleasant since I was just wearing medium-weight baselayers, but I couldn't help but pause and extra second or two to admire the beauty of the milky way stretched across the night sky. Even more impressive when viewed through Gen 3 night vision (which I had brought along for our night shooting session). It did get chilly inside the tent but I definitely noticed that it was warmer inside the tent than outside when I stepped back inside. Even though I didn't feel that I was generating much heat, it was enough for the rain fly to retain inside and make a difference. I actually slept all the way through to dawn, right after that, which is unusual for me when camping. I caught some nice photos below, just after sunset, and later on at dawn. Even on windy nights, the wind usually dies down in the wee hours of the morning, and dawn in the desert is silent. The moon was still quite high as the sky slowly got lighter. I inspected the inside of the tent surface for condensation but it was dry. The next afternoon, the wind started kicking up right before we broke camp; ironically. Breaking down the Losi was very straightforward. When folding up the tent poles, I usually break them down at one end and keep disassembling the segments as I pull them out of the sleeves. However, I learned that it's a good idea to break them down starting at the halfway point first, rather than at the end, to prolong the life of the internal shock cord. Losi has a video on the proper way to break down tent poles here that explains it. Of course, the tent and fly didn't fold up quite as neatly and compactly as when I had done it at home, as I was fighting wind gusts, but I got everything packed into the stuff sack easily. In closing, the Losi Combat 2P SE is a well-designed, quick and easy to set up 3-season tent that's light enough for two people to backpack with, and offers a very livable space inside. The tent has a lot of features that warfighters and civilians alike will appreciated, and gives it more of a 'home away from home' feel than just a plain old shelter. Combined with Nemo's sleeping pad and pillow, it's can be downright luxurious, depending on your weight constraints. I look forward to taking the Losi out again for more nights under the stars. Nemo is planning on launching their Shield Edition website some time in the 2nd quarter of 2013; in the mean time, direct all inquiries about Nemo Shield Edition products to journey@nemoequipment.com or download the 2013 Nemo Shield Edition Catalog here.